If you want to shop more ethically, support independent businesses and vegan charities, or just stuff your face with vegan food - there’s definitely a market here that’ll suit you. Fat Gay Vegan and EAT WORK ART are the masterminds behind the weekly Hackney Downs Vegan Market. This Christmas edition is bringing ALL the delicious vegan goodness to London for a 2-day extravaganza. The line-up is likely to be announced soon. The Brighton Open Market is hosting an event to raise money for the homeless. So not only does this market help support independent, vegan businesses in Brighton, but it also aids the less fortunate just in time for the colder months. As well as being fully vegan, there’s a focus on recycled goods and being low-waste. London’s first ever zero-waste Christmas market is taking place next weekend! Particularly if it’s your first zero-waste Christmas, make sure you head to the Hoxton Arches to pick up some supplies, and support sustainable businesses. The hosts, Zero Waste Goods, have teamed up with 25 brands that offer ethical, green and high-quality products that will make perfect gifts for your loved ones this year. Animal Aid have put on 25 wonderful fayres in the past, so why not join them this Christmas to celebrate their 26th - as they must be doing something right! There will be a range of vegan and cruelty-free items, such as, beer, dairy-free cheese, clothing, baked goods, toiletries and jewellery. You can do a bit of your ethical Christmas shopping, whilst supporting various animal charities that will also have stalls at the fayre. 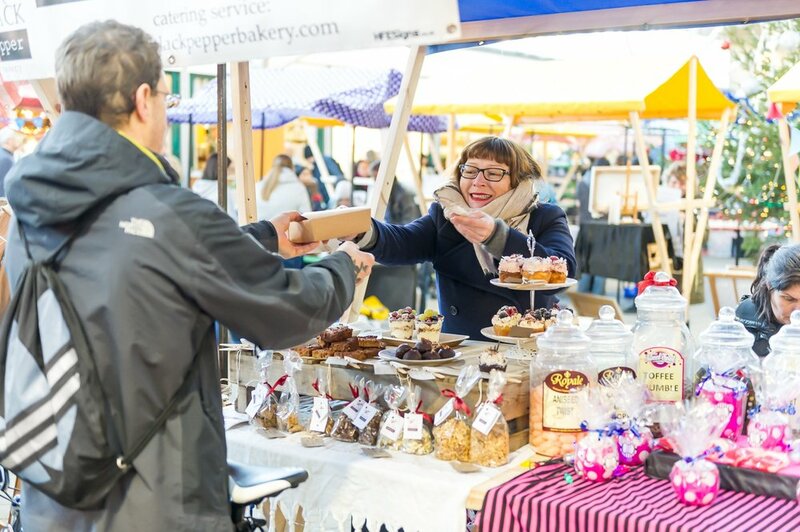 Vegan Route are back for another Christmas themed market set in the iconic space of Blue House Yard. There will be chalet-shops, a double decker bus and heart-warming food options from London’s favourite street food traders. Some of the vendors include: Green Beauty, HarmLess, The Green Grill, Shakey Shakey, and more. Fat Gay Vegan has put together another successful vegan market, but this time at the beautiful Guildhall Yard. This market is the perfect opportunity to grab some last minute vegan gifts, and fill your stomach with some of the greatest vegan street food. There will be a good mixture of vendors such as Vegan Delice, Rupert’s Street, and Self Care Co.